Flares n Seagulls | An alternative music magazine for Aberdeen. …as a “difficult second album” from Best Girl Athlete. Read our review here. Well, it will be tomorrow. Lots of bands to enjoy, here’s a few we’ve seen before but happy to see again. And again. And again. The all new and shiny festival, Carnival 56 is coming to Dundee – 3 days to go and counting. That being so, we thought we’d put together a wee list for your listening pleasure, and to get you in the festival mood. Tickets are still available, so if you find yourselves at a loose end this weekend, why not come on down to Carnival 56. Local Musician Craig John Davidson wrote some words on Swans recent gig at The Lemon Tree, Aberdeen. For words and pics click here. This year’s True North music festival will pay homage to one of the most influential rock bands of the 70s – Fleetwood Mac. 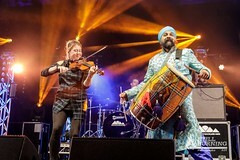 The festival, which runs from September 7-10, will also feature performances from cult bands Arab Strap and Public Service Broadcasting. Tickets for True North are on sale to APA Friends next Wednesday (June 21) and to general bookers on Friday (June 23). Tickets range from £11 to £22 and multi-buy discounts are available. They can be bought online at aberdeenperformingarts.com, in person at the Box Office at HMT or The Lemon Tree, or by phone on (01224) 641122. A Fringe line-up and support acts for the festival will be announced in the coming weeks, to include a production masterclass and intimate music sessions at the Maritime Museum among other events. Now and again we see an artist perform and think, now that’s someone I’d like a word or two with. Chris T-T was one of them and he’s back in Aberdeen on Friday night at The Lemon Tree. Still Burning managed to share some words with the main man before the event. Another festival announcement, this time it’s an old favourite though. Great location and the line-up is looking quite tasty. The final tickets go on sale tomorrow, so be ready and good luck!